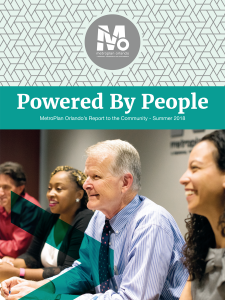 The 2018 MetroPlan Orlando annual report spotlights the people who make our organization’s regional transportation planning efforts work. Titled Powered By People, the report features our new Executive Director Gary Huttmann, AICP, as well as MetroPlan Orlando Board Chairwoman Osceola Cmsr. Cheryl Grieb, and the rest of our staff. We also have a tribute to the work of our former director Harry Barley, who retired from the agency this summer after 22 years of devoted service. Information on regional transportation projects, ongoing programs and exciting opportunities for the future are included to give an overview of Central Florida’s transportation system and how the regional planning efforts of MetroPlan Orlando and our partners are aimed toward a long range vision. You can view the report online here. A community mailing is also underway.